An auto mechanic is exposed to a variety of hazards in the repair shop: Slip and fall accidents caused by spilled motor oil, cuts and bruises from mishandling tools, and also exposure to asbestos from replacement car parts that contain the toxic mineral. 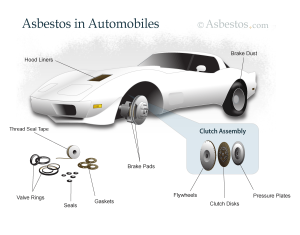 Auto parts, including brakes, clutches and heat seals, contain asbestos because of its heat-resistant qualities, but when these parts start to break apart or disintegrate, the asbestos escapes into the air and onto the clothes of the auto mechanics. Since repair shops also are notorious for poor indoor air quality and circulation, the combination of inadequate air flow and free-floating asbestos particles makes this occupation especially dangerous. Asbestos was a popular component for vehicular brakes because of its heat resistance and strength. The concentration of asbestos in these components was estimated at 30 to 80 percent. The number of American automobile mechanics exposed to asbestos dust from brake and clutch work is estimated at 900,000. The routine tasks of “blowing out” brake surfaces (using an air hose to clean the surfaces) and beveling were considered two of the most common ways these workers were exposed. The use of asbestos for brake linings was never abandoned completely. In 1993, Ford was still using them on the Crown Victoria to silence a brake noise problem. These asbestos linings are also still in use in high-end imports like the Land Rover and can even be purchased in the aftermarket, meaning parts from a manufacturer other than the original maker of the vehicle. Front-wheel drive also contributes to asbestos exposure because these vehicles require semi-metallic front disc brake pads that withstand up to extreme temperatures reached during operation of the vehicle. Hoodliners: Over the past few decades, millions of vehicles have been manufactured with automotive hood liners constructed from asbestos fibers. While asbestos is remarkably fire-resistant, it is also the leading cause of mesothelioma, an extremely deadly form of cancer. Clutches: Some clutch parts in use today, both in new and older car models, contain asbestos. During normal wear, the asbestos is ground down and may collect around the parts and in clutch compartments. When the disc, clutch cover, drum or wheel is removed, that dust may be released into the air where it can be inhaled or swallowed. Gasket Material, Heat Seals, Valve Rings and Packing: For decades, asbestos-containing gaskets, heat seal material, valve rings, and packing were used in virtually every system that involved the transport of fluids or gases. Prior to the mid-1970s, some automobile exhaust systems contained asbestos gaskets either at flanges along the exhaust pipes or at the exhaust manifolds of the engine. An investigation conducted by the Seattle Post-Intelligencer found the high exposure levels at gas stations and brake repair shops could place approximately 1 in 10 unprotected mechanics at risk for developing an asbestos-related cancer. The study examined shops located in cities such as Baltimore, Maryland; Boston, Massachusetts; Chicago, Illinois; Denver, Colorado; Richmond, Virginia; Seattle, Washington; and Washington, D.C.
Dust found in shops and garages contained between 2.26 percent and 63.8 percent asbestos. According to the U.S. Environmental Protection Agency (EPA), the use of protective suits and respirators is required if 1 percent or more of asbestos is present. The report from the Post-Intelligencer also found significant amounts of asbestos in 6 out of 9 brake jobs that were examined. A detailed diagram of where Asbestos-Related Automotive Parts are found in automobiles. When asbestos-containing materials are disturbed or damaged, they release a dust filled with microscopic asbestos fibers into the air. As a result, the very nature of brake and clutch functions causes continual abrasion, and this releases the imbedded asbestos fibers. A large portion of the toxic material is trapped inside the brake housing or clutch space, and is then released when replacement or repair work is performed. Asbestos fibers can be further spread into the surrounding air by the vacuums used to clean the work area during and after the job. The fibers tend to linger in the air long after a job is done and can spread 75 feet from the work area, potentially exposing other mechanics and customers who enter the shop. Airborne asbestos fibers are easily inhaled and can be ingested if fibers get on hands and clothes. This is a particularly difficult problem for mechanics, since they often get grease on their hands and asbestos fibers can stick to the grease. Tragically, asbestos can even be carried home on workers’ clothing, exposing their families to the hazardous material. The Occupational Safety and Health Administration (OSHA) advisory instructs mechanics to assume that all brakes contain asbestos because a mere visual inspection does not indicate which brakes include asbestos and which do not. Using a shop vacuum cleaner is not fine enough to collect asbestos fibers. Using compressed air through a hose to clean drum brakes. Wiping parts with a dry rag or brushing dust off the assembly. Using squirt bottles or solvent sprays top clean parts. Using a water hose to remove dust. The EPA issued a detailed brochure that offers information regarding OSHA’s regulations for commercial automotive shops concerning asbestos. The recommendations are separated into commercial automotive shops that perform more than five brake or clutch jobs per week, and those that perform less than five. Negative-Pressure Enclosure/HEPA Vacuum System Method: This kind of enclosure and vacuum system features a special box with clear plastic walls (or windows), which fits tightly around a brake or clutch assembly in order to prevent asbestos exposure. Low Pressure/Wet Cleaning Method: This specially designed low-pressure spray equipment wets the brake assembly and catches the asbestos-contaminated runoff in a special basin to reduce or prevent airborne brake dust from spreading. Wet Wipe Method: This method uses a spray bottle (or other device that can deliver a fine mist of water), or amended water (water with a detergent), at low pressure to wet all brake and clutch parts. These parts can then be wiped with a cloth. For those who repair or replace their own brakes or clutches at home and have no way of knowing if the materials contain asbestos (as is the case in most instances), the EPA recommends having the job done at a commercial shop to avoid exposure. If this is not an option, the agency then recommends using the preventative measures required of commercial shops performing more than five brake or clutch jobs a week. If an individual lacks the professional equipment required, then the wet wipe method is recommended. A number of scientific studies published from 2002-2004 concluded that brake dust was not a cause of mesothelioma. Researcher Murray Finkelstein noticed some characteristics of asbestos fiber analysis used in these studies that led to this conclusion could be interpreted in a different way. He re-analyzed the data published in these studies on the lung content of chrysotile and tremolite asbestos among brake mechanics and control subjects that participated in each of these trials. Average fiber concentrations were higher among the brake workers than the controls. The concentration of tremolite fibers was higher than the concentration of chrysotile in the lung tissue samples that were examined. He concluded that brake mechanics have a significant amount of asbestos fibers in their lung tissue, which was caused by occupational exposure to dust from friction products manufactured from Canadian chrysotile asbestos. This put mechanics at increased risk of asbestos-associated cancers. In 2005, the United Auto Workers (UAW) endorsed a plan to create a $140 billion asbestos compensation fund, a bipartisan compromise agreed to by U.S. Sen. Arlen Specter, R-Penn., who was chairman of the Senate Judiciary Committee, and Sen. Patrick Leahy, D-Vt., the ranking Democrat on the committee. Companies facing asbestos lawsuits and their insurers would contribute to the fund and victims would no longer be able to sue. The highest monetary award of $1.1 million would be reserved for those who developed mesothelioma. However, the fund never got off the ground. Three bills were written to create the fund, but all the proposals died in committee. The UAW has not brought up the issue since then. In January 2019, an Arkansas jury ruled against Honeywell and Pneumo Abex in a case involving a former brake-shoe worker. Ronald Burlie Thomas worked at Stuart’s Brake Shop in Little Rock from 1971 until 1983. He was diagnosed with mesothelioma in March 2017 and died later that year at age 72. Chief U.S. District Judge Brian Miller assigned 18.75 percent of the fault to Honeywell and 9.375 percent of the fault to Pneumo Abex. Thomas’ estate was awarded $18.5 million to cover Thomas’ pain and suffering, medical expenses, anguish to surviving family members and punitive damages. There are a number of companies that have manufactured and sold asbestos-contaminated auto parts. Many of the following companies shut down when the government banned asbestos parts in the 1980s, but since then, a number of lawsuits have been filed as a result of asbestos exposure.